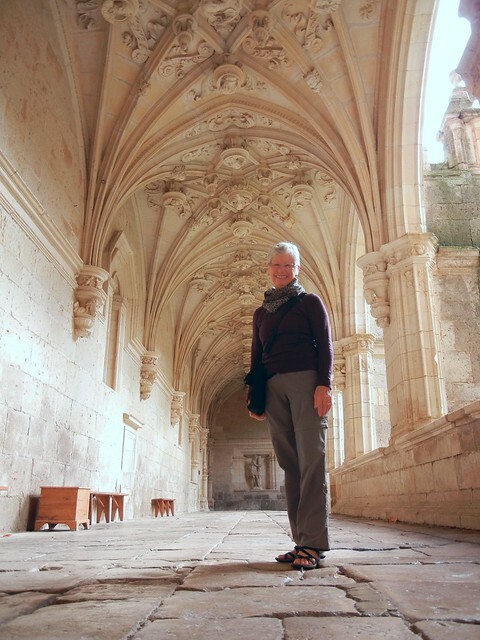 Staying here at the Hotel Real Monasterio San Zoilo for a second night is just what the doctor ordered. Last night Dave wasn’t feeling well enough to have dinner and was in bed by 8 o’clock. I went by myself to the casual, glassed-in restaurant on the hotel grounds for pizza and cerveza. I was happy to be warm and protected from the teaming rain and strong wind. The swirling yellow leaves from all the yellow deciduous trees in the garden made a spectacular scene. Needless to say, all the cars in the parking lot were plastered with leaves. Fall is here and what a beautiful season it is, especially last night. We started off the day with exactly what we needed, a full breakfast complete with orange slices, melons, kiwi fruit, yogurt, eggs, cheese, meat, chocolate-filled pastries, and cafe con leche. There was more that we didn’t have room for, but there is always tomorrow. Does it get any better than that?! 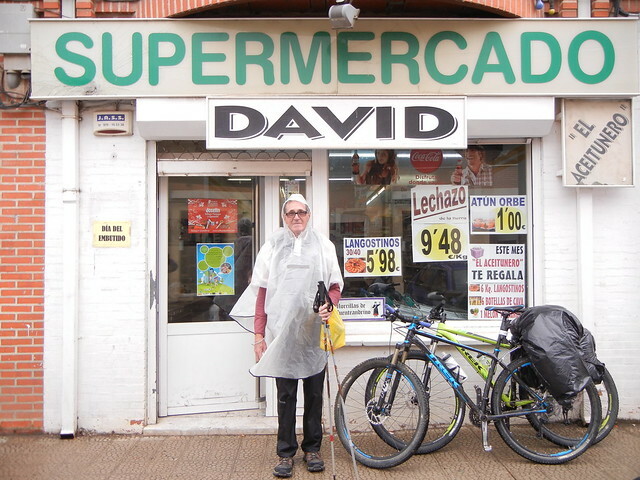 After breakfast Dave walked back to the town centre for the medication he needed at the “farmacia” (pharmacy). It was pouring rain then but now it is afternoon and the sun is shining. 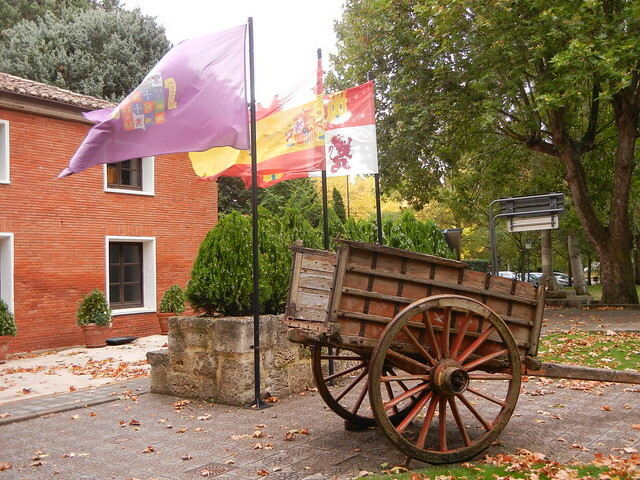 Here is a little information about the Monastery that comes from the brochure in our room: “According to documents from the year 948 A.D. that were found in the history of Carrion de los Condes, the Monastery was dedicated first to St. John the Baptist and then to St. Zoilo. 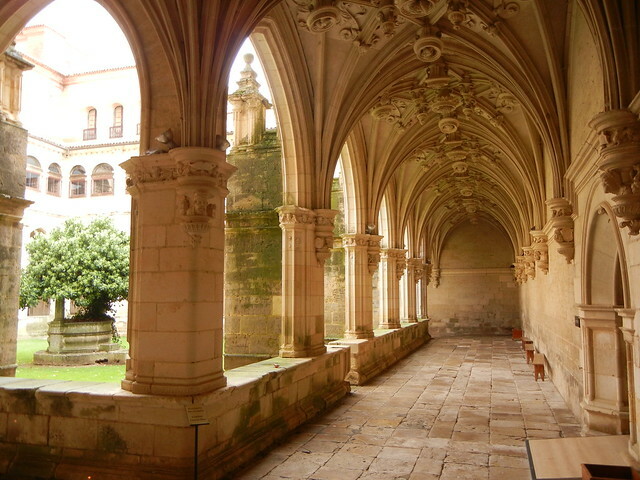 Many monarchs chose the Monastery as a place of repose and used it as the seat of parliament and councils. It feels good to have a day off from the Camino, especially here in this beautiful hotel. What ailed Dave seems to be improving (fingers crossed). We feel fresher and raring to return to the Camino tomorrow. The forecast for tomorrow is for showers in the morning and sun in the afternoon, similar to today but hopefully not the downpour we had. Thank you. I’m glad you are enjoying it. So glad you’ve been able to rest and now feel refreshed and what a beautiful place to recuperate. The progress you’re both making is amazing and we hope that David is feeling well soon. I LOVE the photograph at the bottom with the cart – it’s a painting waiting to happen. The beautiful photographs you’ve taken will provide you with painting material for years, Judy. You are the expert with autumn colours, Maggie! I wouldn’t mind trying to paint that one …maybe one day.